The most notable among a short list of rugby songs, "On The Ball," is now over 100 years old. It was written by E W Secker, a former pupil and Ist XV player at Palmerston North Boys' High School, the first of three Secker generations to attend this celebrated rugby school. 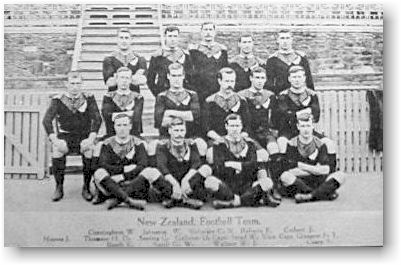 The 1905 All-Blacks (shown above) are supposed to have taken the song on tour with them, and included it in their musical repertoire. As the old Rugby cry, "On the Ball"? Through scrummage, three-quarters and all. And shout as we go, "On the Ball!" Let sluggards at home then remain. As we shout the same merry refrain. But with many a kick and a blow. Still that sure collar "Death" takes us low. To pass, if we play the right game. Which is every true footballer's aim. There's a goal to be reached by and by. And perhaps kick a goal from his try.